The LG SH7B is a soundbar system that can do it all. Its feature set and solid sound quality make it a good choice for those with limited space. While music playback and surround sound aren't mind-blowing, they're good enough for the sticker price. Soundbars are all the rage these days and it's easy to see why – they take up very little space, sound way better than your TV's speakers and are dead-simple to set up. And while some feel that soundbars might not sound as good as a true surround sound system or even a good stereo setup, I've found that they do a good enough job that most people won't mind skimping on some sound quality for an easier setup and smaller price tag. That said, the LG SH7B soundbar system sounds great for the price, offering a ton more features than other soundbars. It's also as easy as it comes to get set up as it doesn't require routing wires or the need for an preamp and amp of a traditional surround sound system. Said simply, the LG SH7B offers an attractive package for movie and music enthusiasts who don't want to break the bank. The soundbar and subwoofer package retails for $500 (about £380, AU$666) but, give it some time, and you'll be able to find it for even lower on the web. The 360-watt LG SH7B comes with a soundbar and subwoofer in the box. The soundbar measures a slim 41.73 x 2.09 x 3.35 inches (L x W x H) and the sub is a compact 6.73 x 12.6 x 9.92 inches (L x W x H). The subwoofer is wireless, so all you need to do is plug in its power cable and it'll sync automatically with the soundbar. There's a single status light located on the subwoofer that tells you if it's connected, which comes in handy if you ever need to troubleshoot it. The LG SH7B offers a ton of flexibility for mounting. Wall mount adapters are included in the package and the soundbar is light enough that it'll fit just about anywhere. Alternatively, if breaking out a drill wasn't on your agenda for today, you can simply place the soundbar flat on your home entertainment center without needing to drill. Plus, since the sub is wireless, you can place it anywhere within the room – but I suggest putting it in a corner to maximize bass impact. Behind the soundbar you'll find connections for HDMI in and out, optical, auxiliary and ethernet. What you don't see physically are connection options for Bluetooth and Wi-Fi that make the LG SH7B quite a versatile speaker setup for all your music or movie streaming needs. While the SH7B's setup was mostly a breeze, I found LG's Music Flow Player app for Android a buggy mess. I tried multiple times to connect the SH7B to my wireless network but it always failed. I switched to my iPad and downloaded the iPhone version of the app and it connected the first time. So much for being platform agnostic. With the SH7B hooked up to your home network, you can use Google Cast to stream your music over Wi-Fi, offering an audible performance bump over the Bluetooth connection. For its light weight and reasonable price tag, the SH7B surprised me with an above average sound. It still sounds like a soundbar – with its narrow imaging and simulated surround sound – but this is the tradeoff you make for going with a simplified audio solution. Movies, overall, sound good, with powerful bass impact and distortion-free playback, even at higher volumes. Out of the box, the bass is a little overbearing, but that can be adjusted with the included remote. For the most part, mids and highs sound good with dialogue sounding clear. Watching Star Wars: The Force Awakens, the sound of blasters and lightsaber wooshes filled my apartment. Lasers hit home with impactful blasts of sound, with the subwoofer generating an impressive amount of bass for its size. However, there was very little surround sound effect, which pulled me out of the experience and made everything sound a bit two dimensional. The SH7B's limited imaging means you won't get true surround sound, but it's not a problem exclusive to LG's latest 'bar – most other soundbars under $1,000 typically face that problem as well. To its credit, though, its sound is concentrated around the center channel but there's still good stereo separation to help create a more immersive listening experience. If you want a comparison to another manufacturer, the Samsung HW-J650 goes for around the same price of the LG, but features an annoying echo effect making the LG a better buy. Music sounds mediocre on the SH7B with the speakers missing top-end resolution and offering sometimes muddy bass. However, turning down the subwoofer level helped to tame the bass and balance the sound. If you're more of a casual music listener, the SH7B is more than adequate but you might be better off with a stereo bookshelf speaker, which will sound better for music and cost a little less. One thing I really enjoyed about the LG SH7B is its ability to be used without turning on the TV. I streamed music via Google Play Music and Soundcloud to the soundbar. I love that Google Cast is built in, making it easy to start streaming music from any Android or iOS device. Although the SH7B doesn't offer the finest audio quality, LG managed to pack its entry-level soundbar full of useful features that still manages to sound good. Having Google Cast built in makes the SH7B a versatile home theater product for all of your music or movie needs. Plus, it's easy to set up and having a wireless subwoofer makes setup easy. You can also add rear Musicflow speakers to upgrade the SH7B into a true surround sound setup. Out of the box, the SH7B has overwhelming bass. It's easy enough to turn down via its remote control, but bass sounds a bit uncontrolled for some movies. While setup is painless for the most part, LG's MusicFlow Android app is extremely buggy compared to the one it released on iOS. 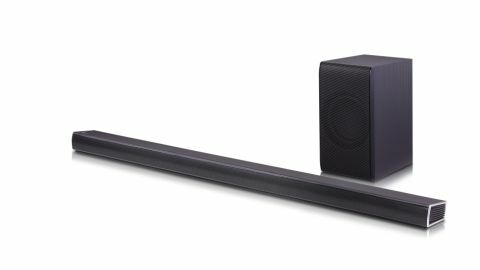 The SH7B still sounds like a soundbar with its limited three-dimensional imaging so those looking for true surround sound should look elsewhere. It's hard to fault the LG SH7B too much – it does a lot with a minuscule physical footprint and a reasonable price tag to match. I really enjoyed my time using it for playing back music and watching movies, even if the lack of true surround sound made the films less immersive than I was used to. That said, it's a breeze to set up since its subwoofer is wireless but Android users may be frustrated by LG's buggy app. Sound quality is great for the price, but in the end loses out to traditional bookshelf speakers in terms of clarity on the high-end. If you want a soundbar that can take on every type of media you can throw at it, though, the LG SH7B is a great option.